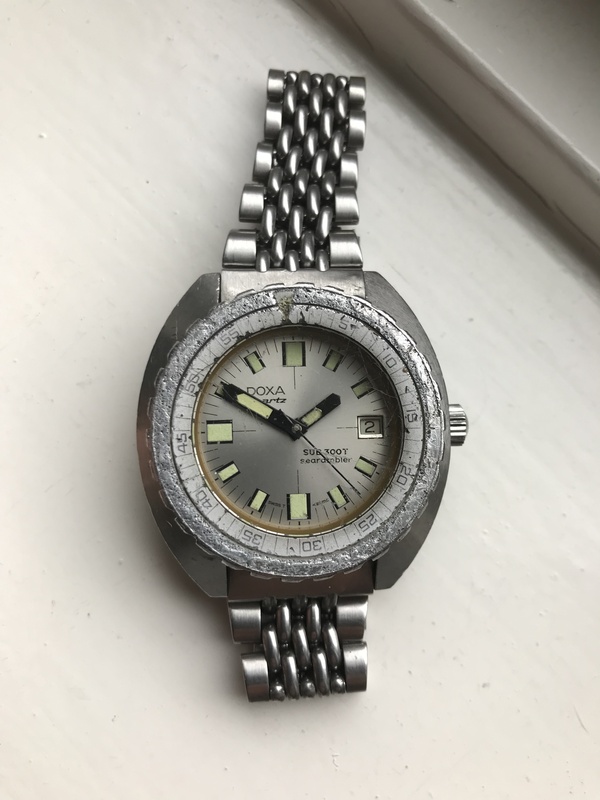 An as found Doxa 300T Searambler quartz with original bracelet. Sold exactly as I found it. I bought it from the 2nd owner who himself had acquired it from a diver. Watch has seen serious action, which may explain the battered bezel. It has the standard 42mm Doxa case (size excluding the unmarked screw in crown) and the later Audrey style dial. Normally you would expect an orange dial with black hands combination with a Searambler but not in this case. Movement is a ESA/ETA 536.121. Caseback is marked with the 3D block and 4539/4321 inscription. Bracelet is a Doxa marked easy adjust one on 7720-10 endlinks. More pics upon request. FURTHER REMARKS: Payment in euro. Bank wire strongly preferred. Paypal to be discussed but you pay fees. I have dozens of feedback on various watch forums and about 200 on ebay (as Mark020). Watch and me are in the Netherlands. If required contact via phone/whatsapp/insta(Markk020)/Linkedin possible.